beneficial for high blood pressure. It improves blood circulation, so it is beneficial to arterial hypertension. 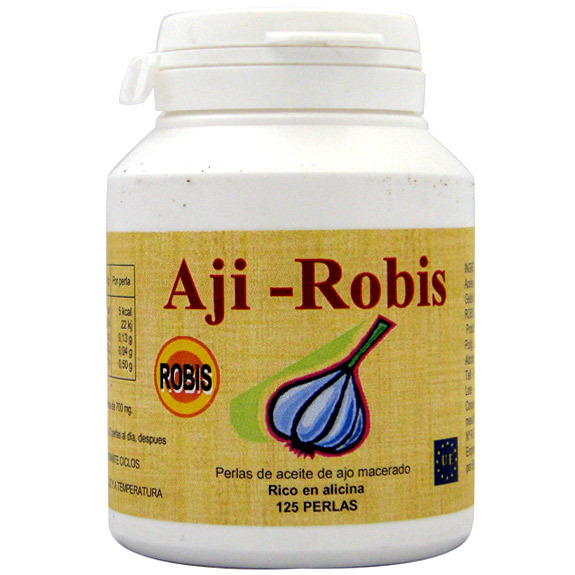 It prevents thromboembolism and arteriosclerosis by its action of decrease in triglycerides and cholesterol. Good intestinal disinfectant. Detoxifying, especially recommended treatments to quit smoking. Normalizes blood, generally high tension of the smoker, he favors the removal of mucus retained in the bronchi and the regeneration of its mucosa, while it helps to overcome the urge to smoke perhaps by the peculiar smell that gives the breath. Characterized by its general antibiotic and antiseptic action. Ingredients: Macerated garlic oil, gelatin and Glycerin. Directions for use: take 2 to 3 capsules a day, after the main meals. Eat during monthly cycles. Presentation: Packet of 125 capsules of 700 mg.